Trophy Store, the UK’s largest online retailer of trophies medals and awards, has announced the launch of a new range of heavyweight football trophies. TrophyStore.co.uk is the UK's largest online provider of trophies, medals and awards. Trophy Store, the UK’s largest online retailer of trophies medals and awards, has announced the launch of a new range of heavyweight football trophies. 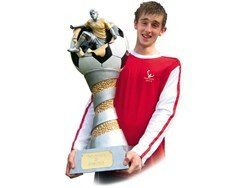 The new for 2012 Xplode range includes a heavy weight resin 3D football trophy measuring a massive 32” (80cm) high. “With the football season drawing to a close we are preparing for our busiest three months of the year” commented Trophy Store manager Ashley Pitcher, “although we supply awards for almost every event in the sporting calendar, football is still the by far the largest sporting customer for trophies and medals”. Trophy Store offer a huge selection of football awards with 100’s of varieties to choose from and catering for all areas of the game including awards for Female Footballers, Goalkeepers, Individual Player Awards, Referee and Officials, Man of the Match Trophies and Glass Football Awards. Most of the awards available can be engraved by one of Trophy Store’s professional in-house engraving team to ensure that touch of personalisation befitting of any important event. TrophyStore.co.uk Ltd is the UK’s largest online provider of trophies, medals and awards. Based in Atherstone, Warwickshire, Trophy Store supply are suppliers of awards to over half of the FTSE 100 companies as well as public sector organisations including schools, colleges, NHS, Ministry Of Defence, BBC and the emergency services.